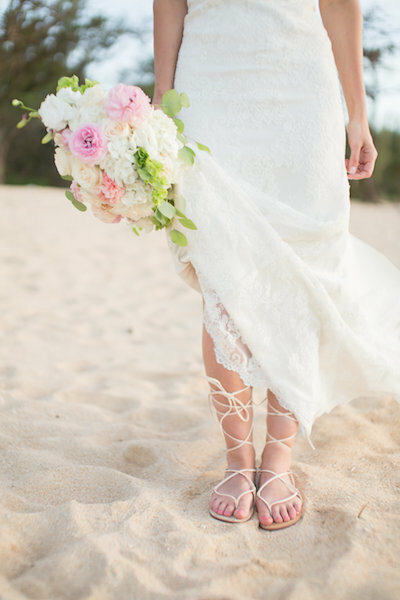 Jenna and Bobby’s Maui Beach Wedding was full of so much genuine excitement! It is a day we will never forget, and we are positive neither will they. These lovebirds met thru a friend, after which Bobby won Jenna over by showing his true character when he stood by her during a tough period in her life. When most guys would have left, he supported her and showed her love. With a relationship built on loyalty, trust, and unconditional love, we have no doubt these two will have a long and happy marriage! This couple makes it a point to always keep each other laughing! As you can tell Bobby is quite the character, he’s already proven he knows how to support his bride during hard times and we love that he also will do anything to make her smile! 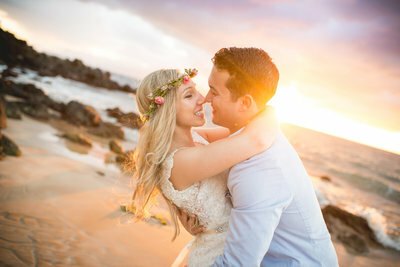 Their Maui Beach Wedding had them both grinning from ear to ear all evening long. This bride and groom couldn’t have been happier and we especially love how their family and friends joined in on the festivities. After the ceremony, Bobby was lifted over a weddings guest’s shoulder and we couldn’t help but crack up! One thing’s for sure, these newlyweds have an amazing adventure waiting for them as husband and wife! 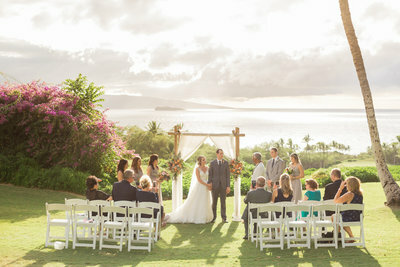 Thank you, Jenna and Bobby, for including Simple Maui Wedding on your very special day! Congratulations and Warm Aloha!